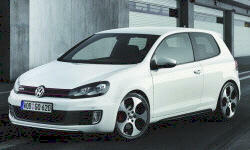 2013 Volkswagen Golf / GTI Pros and Cons | Page 1 of 1 | Why Not This Car? What drives people to buy (or not buy) a certain car? TrueDelta's members share 2013 Volkswagen Golf / GTI pros and cons based on their real-world driving experiences. If there were a category for a high end economy car, the sub $21K VW Golf 2.5 has the market covered. No other car in this category comes close. VW has a winner here. The Golf TDI was much more nimble feeling than the Honda Accord coupe. We took both on narrow winding frost-heaved Connecticut back roads and the VW was much more in its element, while the Honda crashed on its bump stops and plowed in the corners. Fun to drive while getting mid-40's miles per gallon. Quiet, enough room for a small family, and remarkably well made. What's not to like? See below.